I'm wearing an extremely princess-y manicure today! I did these nails Saturday after deciding I wanted something holographic and was inspired by some pretty glitter gradients on other blogs. Then I realized that all the polishes I used were essentially untrieds - swatched but never used in a manicure. So I'll be talking a bit about them, too. Color Club Halo-graphic, Milani Pink Flare, Nyx Girls Dynamic Glitter and Salon Perfect Silver Sparkler. 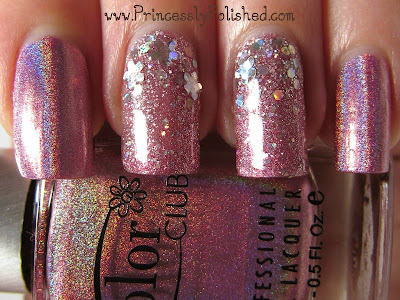 First let's talk about Color Club Halo-graphic. How did I let this go for so long without doing a proper manicure with it? 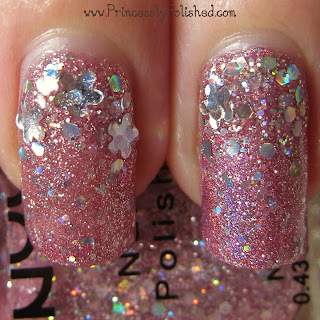 From the 2012 Halo Hues collection, this pink is gorgeous in the bottle and cool-toned enough that I find it wearable. I used two coats on my thumbs, index and pinky fingers, then my regular Poshe topcoat. Once the manicure is totally dry the holographic effect comes back 100%. Application is good for a holographic polish, but isn't very self-leveling. 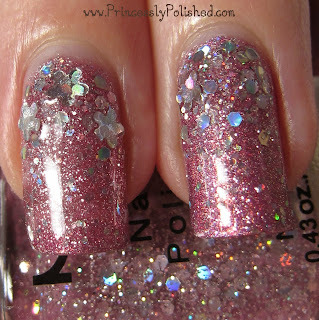 Milani Pink Flare is part of the One Coat Glitter line, but it is most certainly not opaque in one coat. My right hand, pictured above, shows this polish at one coat on my ring finger and at two on my middle finger. Both have one coat of Halo-graphic as a base/underwear color. I must say I love this glitter, it is the perfect combination of soft and sparkly. Different from my expectations but I don't like it any less. The photos below show my left hand. I had the good sense to wrap my tips with Halo-graphic before putting on a coat of Pink Flare, so the sheerness isn't noticeable unless you're really looking. My middle finger (three flower-shape paillettes) is wearing 4 coats of Milani Pink Flare, and if you look closely you can still see some VNL. As soon as I saw how sheer it was I put a base coat of Color Club Halo-Graphic down on my ring finger, and only used two coats of Pink Flare. For the gradients I used a combination of Nyx Dynamic Glitter and Salon Perfect Silver Sparkler. I started off by dabbing Dynamic glitter at the cuticles and then placed individual glitters from Silver Sparkler to fill in spaces that needed it. I also used loose flower paillettes to enhance the gradient nails. These nails would have had a lot of texture so I used extra topcoat until they were smooth and super glossy!